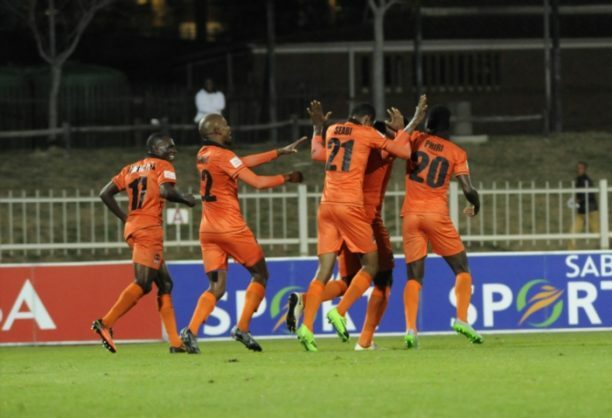 Polokwane City got their first league win of 2017, as they outplayed Platinum Stars 1-0 in an Absa Premiership match played at the Old Peter Makaba Stadium in Polokwane on Wednesday evening. A 28th minute strike by defender Thapelo Tshilo was the difference between the two sides, on a day that the hosts made more headlines off the field than on with the news that City’s former coach Luc Eymael had been ordered by the PSL Resolution Chamber to return to the Limpopo club to complete the two and a half years remaining of his contract. The Belgian recently had a fall out with the City chairman and left the club to coach relegation-haunted Bloemfontein Celtic. City took to the field without their suspended striker Esau Kanyenda and with leading marksman Rodney Ramagalela closely marked, the hosts had to work hard to create scoring opportunities. Tshilo’s strike, ended a barren run of form for the Polokwane side, who had gone 10 league games without a win, and had tallied up 13 league draws in their 24 matches played in the league this season. The visitors’ Malawian midfielder Robert Ng’ambi was more than a handful for City to contend with in the middle of the park, with the home team’s rearguard doing well to restrict the visitors’ raids on the City goal. Stars went into the match off the back of their 3-0 win over Ivory Coast side Tanda FC in the CAF Confederation Cup on Sunday, which saw the men from Rustenburg advance to the next round 3-2 on aggregate, but the hectic football schedule of matches has taken its toll on Cavin Johnson’s men. They find themselves just above the relegation zone with 25 points from 24 matches and just four points off the last-placed team. While City, now with 31 points from 24 matches, will be looking to enhance their chances of a top 8 league table finish when they host Golden Arrows in their next league encounter next Wednesday, Stars will turn their attention to Nedbank Cup action, when they visit Arrows in quarterfinal action on Saturday.